For a chronological guide to this subject, see Timeline of the presidency of Ronald Reagan. Domestically, the Reagan administration enacted a major tax cut, sought to cut non-military spending, and eliminated federal regulations. The administration's economic policies, known as "Reaganomics", were inspired by supply-side economics. The combination of tax cuts and an increase in defense spending led to budget deficits, and the federal debt increased significantly during Reagan's tenure. 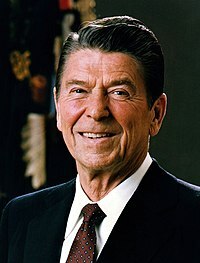 Reagan signed the Tax Reform Act of 1986 (which simplified the tax code by reducing rates and removing several tax breaks) and the Immigration Reform and Control Act of 1986 (which enacted sweeping changes to U.S. immigration law and granted amnesty to three million illegal immigrants). Reagan also appointed more federal judges than any other president, including four Supreme Court Justices. Reagan's foreign policy stance was resolutely anti-communist; its plan of action, known as the Reagan Doctrine, sought to roll back the global influence of the Soviet Union in an attempt to end the Cold War. Under this doctrine, the Reagan administration initiated a massive buildup of the United States military; promoted new technologies such as missile defense systems; and, in 1983, undertook an invasion of Grenada, the first major overseas action by U.S. troops since the end of the Vietnam War. The administration also created controversy by granting aid to paramilitary forces seeking to overthrow leftist governments, particularly in war-torn Central America and Afghanistan. Specifically, the Reagan administration engaged in covert arms sales to Iran to fund Contra rebels in Nicaragua that were fighting to overthrow their nation's socialist government; the resulting scandal led to the conviction or resignation of several administration officials. During Reagan's second term, he sought closer relations with Soviet leader Mikhail Gorbachev, and the two leaders signed a major arms control agreement known as the INF Treaty. 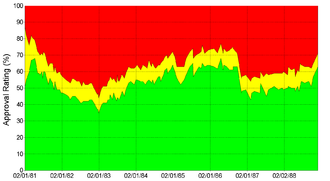 Leaving office in 1989, Reagan held an approval rating of 68%. This rating matches the approval ratings of Franklin D. Roosevelt and Bill Clinton as the highest rating for a departing president in the modern era. Historians and political scientists generally rank Reagan as an above-average president. Due to Reagan's impact on public discourse and advocacy of American conservatism, some historians have described the period during and after his presidency as the Reagan Era. Reagan was the leader of a dramatic conservative shift that undercut many of the domestic and foreign policies that had dominated the national agenda for decades. A major factor in the rise of conservatism was the growing distrust of government to do the right thing on behalf of the people. While distrust of high officials had been an American characteristic for two centuries, the Watergate scandal engendered heightened levels of suspicion of the government. The media was energized in its vigorous search for scandals, which deeply impacted both major parties at the national state and local levels. At the same time there was a growing distrust of long-powerful institutions such as big business and labor unions. The postwar consensus regarding the value of technology in solving national problems came under attack; nuclear power especially was criticized by the New Left. Reagan, who had served as Governor of California from 1967 to 1975, narrowly lost the 1976 Republican presidential primaries to incumbent President Gerald Ford. With the defeat of Ford by Democrat Jimmy Carter in the 1976 election, Reagan immediately became the front-runner for the 1980 Republican presidential nomination. A darling of the conservative movement, Reagan faced more moderate Republicans such as George H. W. Bush, Howard Baker, and Bob Dole in the 1980 Republican presidential primaries. After Bush won the Iowa caucuses, he became Reagan's primary challenger, but Reagan won the New Hampshire primary and most of the following primaries, gaining an insurmountable delegate lead by the end of March 1980. Ford was Reagan's first choice for his running mate, but Reagan backed away from the idea out of the fear of a "copresidency" in which Ford would exercise an unusual degree of power. Reagan instead chose Bush, and the Reagan-Bush ticket was nominated at the 1980 Republican National Convention. Meanwhile, Carter won the Democratic nomination, defeating a primary challenge by Senator Ted Kennedy. Polls taken after the party conventions showed a tied race between Reagan and Carter. An independent candidate, former Republican Congressman John B. Anderson, also appealed to numerous moderates. The 1980 general campaign between Reagan and Carter was conducted amid a multitude of domestic concerns and the ongoing Iran hostage crisis. After winning the Republican nomination, Reagan pivoted to the center. Though he continued to champion a major tax cut, Reagan backed off of his support for free trade and the privatization of Social Security, and promised to consider arms control treaties with the Soviet Union. He instead sought to focus the race on Carter's handling of the economy. Mired with an approval rating in the low 30s, Carter also waged a negative campaign, focusing on the supposed risk of war if Reagan took office. Reagan and Carter met in one presidential debate, held just one week before election day. Reagan delivered an effective performance, asking voters, "Are you better off than you were four years ago?...Is America as respected throughout the world as it was?" Though the race had been widely regarded as a close contest, Reagan won over the large majority of undecided voters. Reagan took 50.7% of the popular vote and 489 of the 538 electoral votes. Carter won 41% of the popular vote and 49 electoral votes, while Anderson won 6.6% of the popular vote. In the concurrent congressional elections, Republicans took control of the Senate for the first time since the 1950s, while Democrats retained control of the House of Representatives. Reagan chose Alexander Haig, a former general who had served as chief of staff to Richard Nixon, as his first secretary of state. Other major Cabinet appointees included Secretary of Defense Caspar Weinberger, a former Nixon cabinet official who would preside over an increase in defense spending, and Secretary of the Treasury Donald Regan, a bank executive. Reagan selected David Stockman, a young congressman from Michigan, as the Director of the Office of Management and Budget. CIA director William J. Casey emerged as an important figure in the administration, as the CIA would figure prominently into Reagan's Cold War initiatives. Reagan downgraded the importance of the national security advisor, and six different individuals held that position during Reagan's presidency. Haig left the cabinet in 1982 after clashing with other members of the Reagan administration, and was replaced by another former Nixon administration official, George P. Shultz. By 1982, National Security Advisor William P. Clark Jr., Ambassador to the United Nations Jeane Kirkpatrick, and CIA Director Casey had established themselves as the major figures in the formulation of the administration's foreign policy. Shultz eventually emerged as the administration's most influential foreign policy figure, moving the administration towards a less confrontational policy with the Soviet Union. Baker and Treasury Secretary Regan switched positions at the beginning of Reagan's second term. Regan centralized power within his office, and he took on the responsibilities that had been held by Baker, Deaver, and Meese, the latter of whom succeeded William French Smith as attorney general in 1985. Regan frequently clashed with First Lady Nancy Reagan, and he left the administration in the wake of the Iran–Contra affair and Republican losses in the 1986 mid-term elections. Regan was replaced by former Senate Majority Leader Howard Baker. Reagan made four successful appointments to the Supreme Court during his eight years in office. In 1981, he successfully nominated Sandra Day O'Connor to succeed Associate Justice Potter Stewart. Reagan had promised to name the first woman to the Supreme Court in the 1980 presidential campaign, and he nominated her. Democrats had planned to vigorously oppose Reagan's nominations to the Court, but instead they applauded and she was confirmed unanimously. The Christian right element in the Reagan coalition strongly supported him in 1980, in the belief that he would appoint Supreme Court justices to overturn Roe V Wade. They were astonished and dismayed with O’Connor, whom they feared would tolerate abortion. They worked hard to defeat her confirmation but failed. They felt betrayed. O'Connor served on the Supreme Court until 2006, and proved to be a centrist conservative. 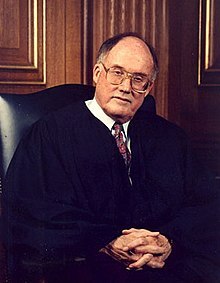 In 1986, Reagan elevated Associate Justice William Rehnquist to the position of Chief Justice of the United States after Warren Burger chose to retire. Rehnquist, a member of the conservative wing of the Court, was the second sitting associate justice to be elevated to chief justice, after Edward Douglass White. Reagan successfully nominated Antonin Scalia to fill Rehnquist's position as an associate justice of the Supreme Court. Scalia became a member of the Court's conservative wing. Reagan faced greater difficulties in filling the final Supreme Court vacancy, which arose due to the retirement of Lewis F. Powell Jr. Reagan nominated Robert Bork in July 1987, but the nomination was rejected by the Senate in October 1987. Later that month, Reagan announced the nomination of Douglas H. Ginsburg, but Ginsburg withdrew from consideration in November 1987. Finally, Reagan nominated Anthony Kennedy, who won Senate confirmation in February 1988. Along with O'Connor, Kennedy served as the key swing vote on the Supreme Court in the decades after Reagan left office. Reagan appointed a combined total of 368 judges to the United States courts of appeals and the United States district courts, more than any other president. The vast majority of his judicial appointees were conservative white men, and many of the appointees were affiliated with the conservative Federalist Society. Partly because Congress passed a law creating new federal judicial positions in 1984, Reagan had appointed nearly half of the federal judiciary by the time he left office in 1989. On March 30, 1981, only 69 days into the new administration, Reagan, his press secretary James Brady, Washington police officer Thomas Delahanty, and Secret Service agent Tim McCarthy were struck by gunfire from would-be assassin John Hinckley Jr. outside the Washington Hilton Hotel. Although Reagan was initially reported to be "close to death", he recovered and was released from the hospital on April 11, becoming the first serving president to survive being wounded in an assassination attempt. The failed assassination attempt had great influence on Reagan's popularity; polls indicated his approval rating to be around 73%. Many pundits and journalists later described the failed assassination as a critical moment in Reagan's presidency, as his newfound popularity provided critical momentum in passing his domestic agenda. Reagan implemented economic policies based on supply-side economics, advocating a laissez-faire philosophy and free-market fiscal policy. Reagan's taxation policies resembled those instituted by President Calvin Coolidge and Treasury Secretary Andrew Mellon in the 1920s, but Reagan was also strongly influenced by contemporary economists such as Arthur Laffer, who rejected the then-dominant views of Keynesian economists. Reagan relied on Laffer and other economists to argue that tax cuts would reduce inflation, which went against the prevailing Keynesian view. Supply-side advocates also asserted that cutting taxes would ultimately lead to higher government revenue due to economic growth, a proposition that was challenged by many economists. Republican Congressman Jack Kemp and Republican Senator William Roth had nearly won passage of a major tax cut during Carter's presidency, but Carter had prevented passage of the bill due to concerns about the deficit. Reagan made the passage of Kemp-Roth bill his top domestic priority upon taking office. As Democrats controlled the House of Representatives, passage of any bill would require the support of some House Democrats in addition to the support of congressional Republicans. Reagan's victory in the 1980 presidential campaign had united Republicans around his leadership, while conservative Democrats like Phil Gramm of Texas (who would later switch parties) were eager to back some of Reagan's conservative policies. Throughout 1981, Reagan frequently met with members of Congress, focusing especially on winning support from conservative Southern Democrats. In July 1981, the Senate voted 89-11 in favor of the tax cut bill favored by Reagan, and the House subsequently approved the bill in a 238-195 vote. The Economic Recovery Tax Act of 1981 cut the top marginal tax rate from 70% to 50%, lowered the capital gains tax from 28% to 20%, more than tripled the amount of inherited money exempt from the estate tax, and cut the corporate tax. Reagan's success in passing a major tax bill and cutting the federal budget was hailed as the "Reagan Revolution" by some reporters; one columnist wrote that the Reagan's legislative success represented the "most formidable domestic initiative any president has driven through since the Hundred Days of Franklin Roosevelt." Faced with concerns about the mounting federal debt, Reagan agreed to raise taxes, signing the Tax Equity and Fiscal Responsibility Act of 1982 (TEFRA). Many of Reagan's conservative supporters condemned TEFRA, but Reagan argued that his administration would be unable to win further budget cuts without the tax hike. Among other provisions, TEFRA doubled the federal cigarette tax and rescinded a portion of the corporate tax cuts from the 1981 tax bill. By 1983, the amount of federal tax had fallen for all or almost all American taxpayers, but most strongly affected the wealthy; the proportion of income paid in taxes by the richest one percent fell from 29.8 percent to 24.8 percent. Partly due to the poor economy, Reagan's legislative momentum dissipated after his first year in office, and his party lost several seats in the House in the 1982 congressional elections. Compared to other midterm elections, the losses were relatively small for the party holding the presidency, but conservative Democrats were less open to Reagan's initiatives after 1982. As deficits continued to be an issue, Reagan signed another bill that raised taxes, the Deficit Reduction Act of 1984. With Donald Regan taking over as Chief of Staff in 1985, the Reagan administration made simplification of the tax code the central focus of its second term domestic agenda. Working with Speaker of the House Tip O'Neill, a Democrat who also favored tax reform, Reagan overcame significant opposition from members of Congress in both parties to pass the Tax Reform Act of 1986. The act simplified the tax code by reducing the number of tax brackets to four and slashing a number of tax breaks. The top rate was dropped to 28%, but capital gains taxes were increased on those with the highest incomes from 20% to 28%. The increase of the lowest tax bracket from 11% to 15% was more than offset by expansion of the personal exemption, standard deduction, and earned income tax credit. The net result was the removal of six million poor Americans from the income tax roll and a reduction of income tax liability at all income levels. The net effect of Reagan's tax bills was that overall tax burden held steady at roughly 19 percent of gross national product. Reagan prioritized tax cuts over spending cuts, arguing that lower revenue would eventually require lower spending. Nonetheless, Reagan was determined to decrease government spending and roll back or dismantle Great Society programs such as Medicaid and the Office of Economic Opportunity. In August 1981, Reagan signed the Omnibus Budget Reconciliation Act of 1981, which cut federal funding for social programs like food stamps, school lunch programs, and Medicaid. The Comprehensive Employment and Training Act, which had provided for the employment of 300,000 workers in 1980, was also repealed, and the administration tightened eligibility for unemployment benefits. Notably absent from the budget cuts was the Department of Defense, which saw its budget bolstered. Reagan experienced several legislative successes in his first year in office, but his attempts to cut federal domestic spending after 1981 met increasing congressional resistance. Spending on programs like Supplemental Security Income, Medicaid, the earned income tax credit, and Aid to Families with Dependent Children all increased after 1982. The number of federal civilian employees rose during Reagan's tenure, from 2.9 million to 3.1 million. Reagan's policy of New Federalism, which sought to shift the responsibility for most social programs to state governments, found little support in Congress. In 1981, OMB Director David Stockman won Reagan's approval to seek cuts to Social Security in 1981, but this plan was poorly-received in Congress. In 1982, Reagan established the bipartisan National Commission on Social Security Reform to make recommendations to secure the long-term integrity of Social Security. The commission rejected Social Security privatization and other major changes to the program, but recommended expanding the Social Security base (by including exempt federal and nonprofit employees), raising Social Security taxes, and reducing some payments. These recommendations were enacted in the Social Security Amendments of 1983, which received bipartisan support. While Reagan avoided cuts to Social Security and Medicare for most individuals, his administration attempted to purge many people from the Social Security disability rolls. Reagan's inability to implement major cuts to Social Security solidified its status as the "third rail" of U.S. politics, and future administrations would be reluctant to propose cuts to the popular program. As Reagan was unwilling to match his tax cuts with cuts to defense spending or Social Security, rising deficits became an issue. These deficits were exacerbated by the early 1980s recession, which cut into federal revenue. Unable to win further domestic spending cuts, and pressured to address the deficit, Reagan was forced to raise taxes after 1981. Nonetheless, the national debt more than tripled between fiscal year 1980 and fiscal year 1989, going from $914 billion to $2.7 trillion, while national debt as a percentage of GDP rose from 33 percent in 1981 to 53 percent in 1989. Reagan never submitted a balanced budget during his time in office. In an effort to lower the national debt, Congress passed the Gramm–Rudman–Hollings Balanced Budget Act, which called for automatic spending cuts if Congress was unable to eliminate deficits through the regular budget-making process. However, Congress found ways around the automatic cuts and deficits continued to rise, ultimately leading to the passage of the Omnibus Budget Reconciliation Act of 1990. Reagan took office in the midst of poor economic conditions, as the country experienced stagflation, a phenomenon in which both inflation and unemployment were high. The economy experienced a brief period of growth early in Reagan's first year in office, but plunged into a recession in July 1981. As the recession continued in the first two years of Reagan's presidency, many within Reagan's blamed the policies of Paul Volcker, the Chair of the Federal Reserve. Volcker sought to fight inflation by pursuing a policy of "tight money" in which interest rates were set a high level. High interest rates would restrict lending and investment, which would in turn lower inflation, raise unemployment and, at least in the short term, reduce economic growth. Unemployment reached a high of nearly 11% in 1982, poverty rate rose from 11.7 percent to 15 percent. The country emerged from recession in 1983, but not all shared equally in the economic recovery, and economic inequality and the number of homeless individuals both increased during the 1980s. Fearful of damaging confidence in the economic recovery, Reagan nominated Volcker to a second term in 1983, and Volcker remained in office until 1987. Inflation dropped to approximately 3.5% in 1985, while the unemployment rate fell to about 5% in 1988. In 1987, Reagan appointed conservative economist Alan Greenspan to succeed Volcker, and Greenspan would lead the Federal Reserve until 2006. Greenspan raised interest rates in another attempt to curb inflation, setting off a stock market crash in October 1987 known as "Black Monday," but the markets stabilized and recovered in the following weeks. In August 1981, the Professional Air Traffic Controllers Organization (PATCO), which consisted of federal employees, voted to go on a labor strike in hopes of receiving better pay and benefits. After the vote, Reagan announced that the strikers would be fired if they did not return to work within forty-eight hours. After the deadline passed, Reagan fired over 10,000 air traffic controllers, while approximately 40 percent of the union members returned to work. Reagan's handling of the strike was strongly criticized by union leaders, but it won the approval of his conservative base of voters and others in the public. The breaking of the PATCO strike demoralized organized labor, and the number of strikes fell dramatically in the 1980s. Many of the strikes that did occur, including the Arizona copper mine strike of 1983, the 1983 Greyhound bus driver strike, and the 1985 Hormel meatpacking worker strike, ended with dismissal of the strikers. With the assent of Reagan's sympathetic National Labor Relations Board appointees, many companies also won wage and benefit cutbacks from unions, especially in the manufacturing sector. During Reagan's time in office, the share of employees who were part of a labor union dropped from approximately one-fourth of the total workforce to approximately one-sixth of the total workforce. Reagan sought to loosen federal regulation of economic activities, and he appointed key officials who shared this agenda. According to historian William Leuchtenburg, by 1986, the Reagan administration eliminated almost half of the federal regulations that had existed in 1981. The Federal Communications Commission aggressively deregulated the broadcasting industry, eliminating the Fairness Doctrine and other restrictions. The 1982 Garn–St. Germain Depository Institutions Act deregulated savings and loan associations and allowed banks to provide adjustable-rate mortgages. Reagan also eliminated numerous government positions and dismissed numerous federal employees, including the entire staff of the Employment and Training Administration. Secretary of the Interior James Watt implemented policies designed to open up federal territories to oil drilling and surface mining. Under EPA Director Anne Gorsuch, the EPA's budget was dramatically reduced and the EPA loosely enforced environmental regulations. After the passage of the Garn–St. Germain Depository Institutions Act, savings and loans associations engaged in riskier activities, and the leaders of some institutions embezzled funds. In what became known as the Savings and loan crisis, a total of 747 financial institutions failed and needed to be rescued with $160 billion in taxpayer dollars. As an indication of this scandal's size, Martin Mayer wrote at the time, "The theft from the taxpayer by the community that fattened on the growth of the savings and loan (S&L) industry in the 1980s is the worst public scandal in American history...Measuring by money, [or] by the misallocation of national resources...the S&L outrage makes Teapot Dome and Credit Mobilier seem minor episodes." The 1980s saw the highest rate of immigration to the United States since the 1910s, and the proportion of the foreign-born population reached its highest level since the 1940s. Reagan did not make immigration a focus of his administration, but he came to support a package of reforms sponsored by Republican Senator Alan Simpson and Democratic Congressman Romano Mazzoli, which he signed into law as the Immigration Reform and Control Act in November 1986. The act made it illegal to knowingly hire or recruit illegal immigrants, required employers to attest to their employees' immigration status, and granted amnesty to approximately three million illegal immigrants who had entered the United States before January 1, 1982, and had lived in the country continuously. The bill was also contained provisions designed to enhance security measures at the Mexico–United States border. Upon signing the act at a ceremony held beside the newly refurbished Statue of Liberty, Reagan said, "The legalization provisions in this act will go far to improve the lives of a class of individuals who now must hide in the shadows, without access to many of the benefits of a free and open society. Very soon many of these men and women will be able to step into the sunlight and, ultimately, if they choose, they may become Americans." The bill was largely unsuccessful at halting illegal immigration, and the population of illegal immigrants rose from 5 million in 1986 to 11.1 million in 2013. Not long after being sworn into office, Reagan declared more militant policies in the "War on Drugs". He promised a "planned, concerted campaign" against all drugs, in hopes of decreasing drug use, particularly among adolescents. The "crack epidemic," which saw a large number of individuals become addicted to crack cocaine and may have played a role in numerous murders, emerged as a major area of public concern. First Lady Nancy Reagan made the War on Drugs her main cause as First Lady, founding the "Just Say No" drug awareness campaign. Concerns about drug use prompted Congress to pass legislation such as the Comprehensive Crime Control Act of 1984 and the Anti-Drug Abuse Act of 1986, the latter of which granted $1.7 billion to fight drugs and established a mandatory minimum penalties for drug offenses. Reagan also signed the Anti-Drug Abuse Act of 1988, which further increased criminal penalties for drug use and established the Office of National Drug Control Policy. Critics charged that Reagan's policies promoted significant racial disparities in the prison population, were in ineffective in reducing the availability of drugs or crime on the street, and came at a great financial and human cost for American society. Supporters argued that the numbers for adolescent drug users declined during Reagan's years in office. Reagan was largely unable to enact his ambitious social policy agenda, which included a federal ban on abortions and an end to desegregation busing. With Reagan's support, conservative Republican Senator Jesse Helms led an effort to prevent the Supreme Court from reviewing state and local laws mandating school prayer, but Republican senators like Lowell Weicker and Barry Goldwater blocked passage of Helm's bill. Despite the lack of major social policy legislation, Reagan was able to influence social policy through regulations and the appointment of conservative Supreme Court Justices. In 1982, Reagan signed a bill extending the Voting Rights Act for 25 years after a grass-roots lobbying and legislative campaign forced him to abandon his plan to ease that law's restrictions. He also reluctantly accepted the continuation of affirmative action programs and the establishment of Martin Luther King Jr. Day as a federal holiday. The Equal Employment Opportunity Commission and the Justice Department both prosecuted far fewer civil rights cases per year than they had under Carter. In 1988, Reagan vetoed the Civil Rights Restoration Act, but his veto was overridden by Congress. Reagan had argued that the legislation infringed on states' rights and the rights of churches and business owners. My criticism is that [the gay movement] isn’t just asking for civil rights; it’s asking for recognition and acceptance of an alternative lifestyle which I do not believe society can condone, nor can I. Citing national security concerns, the president's national security team pressed for more surveillance power early during Reagan's first term. Their recommendations were based upon the premise that the federal government's intelligence and counterintelligence capabilities had been weakened by presidents Carter and Ford. On December 4, 1981, Reagan signed Executive Order 12333. This presidential directive broadened the power of the government's intelligence community; mandated rules for spying on United States citizens, permanent residents, and on anyone within the United States; and also directed the Attorney General and others to create further policies and procedures for what information intelligence agencies can collect, retain, and share. In the 1986 mid-term elections, Democrats retained a majority of the House and won control of the Senate for the first time since the 1980 elections. Reagan campaigned hard for congressional Republicans, and an October 1986 New York Times/CBS News Poll had found that Reagan had a 67 percent approval rating. However, Senate Republicans faced a difficult map that year, as they had to defend 22 of the 34 seats up for election. Republican losses in the Senate were concentrated in the South and in the farm states. The Republican loss of the Senate precluded the possibility of further major conservative legislation during the Reagan administration. As the first U.S. president invited to speak before the British Parliament (June 8, 1982), Reagan predicted Marxism would end up on the "ash heap of history"
Reagan escalated the Cold War, accelerating a reversal from the policy of détente which had begun in 1979 after the Soviet invasion of Afghanistan. Reagan feared that the Soviet Union had gained a military advantage over the United States, and the Reagan administration hoped to that heightened military spending would grant the U.S. military superiority and weaken the Soviet economy. Reagan ordered a massive buildup of the United States Armed Forces, directing funding to the B-1 Lancer bomber, the B-2 Spirit bomber, cruise missiles, the MX missile, and the 600-ship Navy. In response to Soviet deployment of the SS-20, Reagan oversaw NATO's deployment of the Pershing missile in West Germany. The president also strongly denounced the Soviet Union and Communism in moral terms, describing the Soviet Union an "evil empire." Despite this heavy rhetoric, the Reagan administration continued arms control talks with the Soviet Union in the form of "START." Unlike the "SALT" treaties of the 1970s, which set upper limits on the size of nuclear arsenals, the proposed START treaty would require both sides to reduce their existing nuclear arsenals. In March 1983, Reagan introduced the Strategic Defense Initiative (SDI), a defense project that would have used ground- and space-based systems to protect the United States from attack by strategic nuclear ballistic missiles. Reagan believed that this defense shield could make nuclear war impossible. Many scientists and national security experts criticized the project as costly and technologically infeasible, and critics dubbed SDI as "Star Wars" in reference to a popular film series of the same name. Ultimately, the SDI would be canceled in 1993 due to concerns about its cost and effectiveness as well as a changing international situation. However, the Soviets became concerned about the possible effects SDI would have and viewed its development as a violation of the Anti-Ballistic Missile Treaty. In protest of SDI, the Soviet Union broke off arms control talks, and U.S.-Soviet relations descended to their lowest point since the early 1960s. The Cold War tensions influenced works of popular culture such as The Day After, WarGames, and 99 Luftballons, each of which exhibited the rising public anxiety for the possibility of a nuclear war. Under a policy that came to be known as the Reagan Doctrine, the Reagan administration provided overt and covert aid to anti-communist resistance movements in an effort to "rollback" Soviet-backed communist governments in Africa, Asia, and Latin America. In Eastern Europe, the CIA provided support to the Polish opposition group, Solidarity, ensuring that it stayed afloat during a period of martial law. Reagan deployed the CIA's Special Activities Division to Afghanistan and Pakistan, and the CIA was instrumental in training, equipping, and leading Mujahideen forces against the Soviet Army in the Soviet–Afghan War. By 1987, the United States was sending over $600 million a year, as well as weapons, intelligence, and combat expertise to Afghanistan. 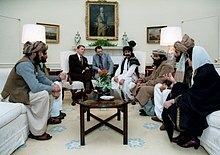 The Soviet Union announced it would withdraw from Afghanistan in 1987, but the U.S. was subjected to blowback in the form of the Taliban and al-Qaeda, two groups that arose out of the Mujahideen and that would oppose the United States in future conflicts. The Reagan administration placed a high priority on the Central America and the Caribbean Sea, which it saw as a key front in the Cold War. Reagan and his foreign policy team were particularly concerned about the potential influence of Cuba on countries such as Grenada, Nicaragua, and El Salvador. To counter the influence of Cuba and the Soviet Union, Reagan launched the Caribbean Basin Initiative, an economic program designed to aid countries opposed to Communism. He also authorized covert measures, such as the arming of Nicaragua's Contras, in order to minimize Cuban and Soviet influence in the region. The administration provided support to right-wing governments throughout Latin America, disregarding humans rights abuses in countries like Argentina and El Salvador. In 1983, pro-Communist forces led a coup in the Caribbean island of Grenada. After learning that Cuban construction workers were building an airfield on Grenada, Reagan dispatched approximately 5,000 U.S. soldiers to invade Grenada. After two days of fighting that resulted in the deaths of nineteen Americans, forty-five Grenadans, and fifty-nine Cubans, the left-wing government of Grenada was overthrown. While the invasion enjoyed public support in the United States and Grenada it was criticized by the United Kingdom, Canada and the United Nations General Assembly as "a flagrant violation of international law". In 1979, a group of left-wing rebels in Nicaragua known as the Sandinistas overthrew the president of Nicaragua and installed Daniel Ortega as the country's leader. Fearing that Communists would take over Nicaragua if it remained under the leadership of the Sandinistas, the Reagan administration authorized CIA Director William J. Casey to arm the right-wing Contras. Congress, which favored negotiations between the Contras and Sandinista, passed the 1982 Boland Amendment, prohibiting the CIA and Defense Department from using their budgets to provide aid to the Contras. Still intent on supporting the Contras, the Reagan administration raised funds for the Contras from private donors and foreign governments. When Congress learned that the CIA had secretly placed naval mines in Nicaraguan harbors, Congress passed a second Boland Amendment that barred granting any assistance to the Contras. During his second term, Reagan sought to find a way procure the release of seven American hostages held by Hezbollah, a Lebanese paramilitary group supported by Iran. The Reagan administration decided to sell American arms to Iran, then engaged in the Iran–Iraq War, in hopes that Iran would pressure Hezbollah to release the hostages. Secretary of Defense Weinberger and Secretary of State Shultz both opposed the arrangement, so it was handled by National Security Advisor Robert McFarlane and McFarlane's successor, John Poindexter. The Reagan administration sold over 2000 missiles to Iran without informing Congress; Hezbollah released four hostages but captured an additional six Americans. On the initiative of Oliver North, an aide on the National Security Council, the Reagan administration redirected the proceeds from the missile sales to the Contras. The transactions became public knowledge by early November 1986. Reagan initially denied any wrongdoing, but on November 25 he announced that Poindexter and North had left the administration and that he would form the Tower Commission to investigate the transactions. A few weeks later, Reagan asked a panel of federal judges to appoint a special prosecutor who would conduct a separate investigation, and the panel chose Lawrence Walsh. The Tower Commission, chaired by former Republican Senator John Tower, released a report in February 1987 that confirmed that the administration had traded arms for hostages and sent the proceeds of the weapons sales to the Contras. The report laid most of the blame for the operation on North, Poindexter, and McFarlane, but it was also critical of Regan and other White House staffers. In response to the Tower Commission report, Reagan stated, "Its findings are honest, convincing and highly critical...As angry as I may be about activities undertaken without my knowledge, I am still accountable for those activities." The Iran–Contra scandal, as it became known, did serious damage to the Reagan presidency, raising questions about Reagan's competency and the wisdom of conservative policies. A poll taken in March 1987 showed that 85 percent of respondents believed that the Reagan administration had engaged in an organized cover-up, and half of the respondents believed that Reagan had been personally involved. The administration's credibility was also badly damaged on the international stage, as it had violated its own arms embargo on Iran. Congressional Democrats considered impeaching, but decided that it would be an unwise use of political capital against a weakened president; Democrats were also somewhat mollified by Reagan's decision to replace Chief of Staff Regan with Howard Baker. The investigations into the Iran–Contra scandal continued after Reagan left office, but were effectively halted when President George H. W. Bush pardoned Secretary of Defense Caspar Weinberger before his trial began. Investigators did not find conclusive proof that Reagan had known about the aid provided to the Contras, but Walsh's report noted that Reagan had "created the conditions which made possible the crimes committed by others" and had "knowingly participated or acquiesced in covering up the scandal." Three different Soviet leaders died between 1982 and 1985, leaving the Soviets with an unstable leadership until Mikhail Gorbachev came to power in 1985. Although the Soviet Union had not accelerated military spending during Reagan's military buildup, their large military expenses, in combination with collectivized agriculture and inefficient planned manufacturing, were a heavy burden for the Soviet economy. Gorbachev was less ideologically rigid than his predecessors, and he believed that the Soviet Union urgently needed economic and political reforms. In 1986, he introduced his twin reforms of perestroika and glasnost, which would change the political and economic conditions of the Soviet Union. Seeking to reduce military expenditures and minimize the possibility of nuclear war, he also sought to re-open negotiations with the United States over arms control. As his influence on domestic affairs waned during his second term, Reagan increasingly focused on relations with the Soviet Union. Reagan recognized the change in the direction of the Soviet leadership under Gorbachev, and shifted to diplomacy, with a view to encourage the Soviet leader to pursue substantial arms agreements. Reagan's personal mission was to achieve a world free of nuclear weapons, which according to Jack F. Matlock Jr., Reagan's ambassador to Moscow, he regarded as "totally irrational, totally inhumane, good for nothing but killing, possibly destructive of life on earth and civilization." Gorbachev and Reagan agreed to meet at the 1985 Geneva Summit, where they issued a joint statement indicating that neither the U.S. nor the Soviet Union would "seek to achieve military superiority." The two leaders began a private correspondence after the summit, and each became increasingly optimistic about arms control negotiations. Reagan's willingness to negotiate with the Soviets was opposed by many conservatives, including Weinberger; conservative columnist George Will wrote that Reagan was "elevating wishful thinking to the status of a political philosophy." Various issues, including intelligence operations performed by both countries and tensions in Germany and Afghanistan, threatened to forestall the possibility of an agreement between the United States and the Soviet Union. Nonetheless, both Gorbachev and Reagan agreed to continue arms control negotiations at the October 1986 Reykjavík Summit. At the summit, Gorbachev and Reagan closed in on an agreement to greatly reduce or eliminate the nuclear stockpiles of both the U.S. and the Soviet Union over a ten-year period, but the deal collapsed due to disagreements regarding SDI development. Reagan attacked Gorbachev in a 1987 speech delivered in West Berlin, but negotiations continued. Gorbachev and Reagan broke the impasse by agreeing to negotiate separate treaties on intermediate nuclear forces (such as intermediate-range ballistic missiles) and strategic arms (such as intercontinental ballistic missiles). With the framework for an agreement in place, Reagan and Gorbachev met at the 1987 Washington Summit. They signed the Intermediate-Range Nuclear Forces Treaty (INF Treaty), which committed both signatories to the total abolition of their respective short-range and medium-range missile stockpiles. The agreement marked the first time that the United States and the Soviet Union had committed to the elimination of a type of nuclear weapon, though it provided for the dismantlement of only about one-twentieth of the worldwide nuclear weapon arsenal. The treaty also established an inspections regime designed to ensure that both parties honored the agreement. In addition to the INF Treaty, Reagan and Gorbachev discussed a potential strategic arms treaty, known as START, but SDI continued to be a major point of contention. In May 1988, the Senate voted 93-to-5 in favor of ratifying the INF Treaty. Though it was attacked by conservatives like Jesse Helms, the INF Treaty provided a major boost to Reagan's popularity in the aftermath of the Iran–Contra Affair. A new era of trade and openness between the two powers commenced, and the U.S. and the Soviet Union cooperated on international issues such as the Iran–Iraq War. When Reagan visited Moscow for a fourth summit with Gorbachev in 1988, he was viewed as a celebrity by the Soviets. A journalist asked the president if he still considered the Soviet Union the evil empire. "No," he replied, "I was talking about another time, another era." At Gorbachev's request, Reagan gave a speech on free markets at the Moscow State University. In December 1988, Gorbachev effectively renounced the Brezhnev Doctrine, paving the way for democratization in Eastern Europe. In November 1989, ten months after Reagan left office, the Berlin Wall fell. The Cold War was unofficially declared over at the Malta Summit the following month. A civil war had broken out in Lebanon in 1975, and both Israel and Syria undertook military action within Lebanon in 1982. After Israel invaded Southern Lebanon, Reagan faced domestic and international pressure to oppose the Israeli invasion, but Reagan was reluctant to openly break Israel. Reagan sympathized with Israeli's desire to defeat PLO forces that had struck Israel from Lebanon, but he pressured Israel to end its invasion as casualties mounted and Israeli forces approached the Lebanese capital of Beirut. American diplomat Philip Habib arranged a cease-fire in which Israel, Syria, and the PLO, all agreed to evacuate their forces from Lebanon. As Israel delayed a full withdrawal and violence continued in Lebanon, Reagan arranged for a multinational force, including U.S. Marines, to serve as peacekeepers in Lebanon. In October 1983, two nearly-simultaneous bombings in Beirut killed 241 American soldiers and 58 French soldiers. The international peacekeeping force was withdrawn from Lebanon in 1984. In reaction to the role Israel and the United States played in the Lebanese Civil War, a Shia militant group known as Hezbollah began to take American hostages, holding eight Americans by the middle of 1985. The Reagan administration's attempts to release these hostages would be a major component of the Iran-Contra Scandal. In response to the U.S. intervention in Lebanon, the Defense Department developed the "Powell Doctrine," which stated that the U.S. should intervene militarily as a last resort and should set clear and limited goals in such interventions. Though termed the Powell doctrine, the policy was originally developed by Secretary of Defense Weinberger, who was influenced not only by Lebanon but also by the experience of the Vietnam War. By late 1985, facing hostile votes from Congress on the issue, Reagan made an "abrupt reversal" on the issue and proposed sanctions on the South African government, including an arms embargo. However, these sanctions were seen as weak by anti-Apartheid activists who were calling for Disinvestment from South Africa. In 1986, Reagan vetoed the tougher sanctions of the Comprehensive Anti-Apartheid Act, but this was overridden by a bipartisan effort in Congress. By 1990, under Reagan's successor George H. W. Bush, the new South African government of F. W. de Klerk was introducing widespread reforms, though the Reagan administration argued that this was not a result of the tougher sanctions. During his 1980 presidential campaign, Reagan proposed the creation of a common market in North America. Once in office, Reagan signed the Trade and Tariff Act of 1984, which granted the president "fast track" authority in negotiating free trade agreements. In 1985, Reagan signed the Israel–United States Free Trade Agreement, the first bilateral free trade agreement in U.S. history. In 1988, Reagan and Canadian Prime Minister Brian Mulroney signed the Canada–United States Free Trade Agreement, which greatly reduced trade barriers between the United States and Canada. This trade pact would serve as the foundation for the North American Free Trade Agreement among the United States, Canada, and Mexico. Reagan made 25 international trips to 26 different countries on four continents—Europe, Asia, North America, and South America—during his presidency. He made seven trips to continental Europe, three to Asia and one to South America. He is perhaps best remembered for his speeches at the 40th anniversary of the Normandy landings, for his impassioned speech at the Berlin Wall, his summit meetings with Mikhail Gorbachev, and riding horses with Queen Elizabeth II at Windsor Park. At the time of his inauguration, Reagan was the oldest person to be inaugurated as President (age 69). He remains the oldest person to have held the office; he had reached the age of 77 when his second term ended. Reagan's health became a concern[to whom?] at times during his presidency. Former White House correspondent Lesley Stahl later wrote that she and other reporters noticed what might have been early symptoms of Reagan's later Alzheimer's disease. She said that on her last day on the beat, Reagan spoke to her for a few moments and did not seem to know who she was before returning to his normal behavior. [dead link] However, Reagan's primary physician, Dr. John Hutton, has said that Reagan "absolutely" did not "show any signs of dementia or Alzheimer's" during his presidency. His doctors have noted that he began exhibiting Alzheimer's symptoms only after he left the White House. On July 13, 1985, Reagan underwent surgery to remove polyps from his colon, causing the first-ever invocation of the Acting President clause of the 25th Amendment. On January 5, 1987, Reagan underwent surgery for prostate cancer which caused further worries about his health, but which significantly raised public awareness of this "silent killer". Reagan's approval ratings fell after his first year in office, but they bounced back when the United States began to emerge from recession in 1983. The leading candidates in the 1984 Democratic presidential primaries were former Vice President Walter Mondale, Senator Gary Hart of Colorado, and African-American civil rights activist Jesse Jackson. Though Hart won several primaries, Mondale ultimately won the nomination. Down in the polls, Mondale selected Congresswoman Geraldine Ferraro as his running mate in hopes of galvanizing support for his campaign, thus making Ferraro the first major party vice presidential nominee in U.S. history. In accepting the Democratic nomination, Mondale attacked Reagan's policies regarding the environment, Social Security, nuclear arms, civil rights, and other issues, stating that the Reagan administration was "of the rich, by the rich, and for the rich." He also criticized the federal debt accumulated under Reagan, stating, "...The budget will be squeezed. Taxes will go up. And anyone who says they won't is not telling the truth to the American people." Reagan, meanwhile, generally declined to offer new legislative proposals for his re-election campaign, instead focusing on events like the U.S.-hosted 1984 Summer Olympics and the 40th anniversary of the Normandy landings. Reagan's ability to perform the duties of president for another term was questioned by some observers, especially after a weak performance in the first presidential debate. His apparent confused and forgetful behavior was evident to his supporters; they had previously known him clever and witty. Rumors began to circulate that he had Alzheimer's disease. Reagan rebounded in the second debate, and confronted questions about his age, quipping, "I will not make age an issue of this campaign. I am not going to exploit, for political purposes, my opponent's youth and inexperience," which generated applause and laughter, even from Mondale himself. Public opinion polling consistently showed a Reagan lead in the 1984 campaign, and Mondale was unable to shake up the race. In the end, Reagan won re-election, winning 49 of 50 states. Mondale carried only his home state of Minnesota and the District of Columbia. Reagan won a record 525 electoral votes, and received 59% of the popular vote to Mondale's 41%. Compared to 1980, Reagan's strongest gains came among white Southern voters, and he also performed particularly well among Catholic voters, voters between the ages of eighteen and twenty-nine, and voters over the age of sixty. In the concurrent congressional elections, Republicans retained control of the Senate and Democrats retained control of the House. Reagan remained publicly neutral in the 1988 Republican presidential primaries, but privately supported Vice President Bush over Senator Bob Dole. The 1988 Republican National Convention, which nominated Bush for president, also acted as a celebration of Reagan's presidency. Democrats nominated Michael Dukakis, the liberal Governor of Massachusetts. Following the 1988 Democratic National Convention, Dukakis led the polls by seventeen points, but Bush, aided by the INF Treaty and the strong economy, closed the gap as the election neared. Democrats tried to link Bush to the Iran-Contra Scandal, but Bush claimed that he had not been involved. The GOP effectively cast Dukakis as "soft" on crime and foreign policy issues, seizing on Dukakis's pardon of Willie Horton and his dispassionate response to a question regarding the death penalty. In the 1988 presidential election, Bush defeated Dukakis, taking 53.4 percent of the popular vote and 426 electoral votes. The election saw the lowest turnout of eligible voters since 1924. In the concurrent congressional elections, Democrats retained control of the House and the Senate. In large part due to his handling of relations with the Soviet Union, Reagan left office with an approval rating of sixty-eight percent. Since Reagan left office in 1989, substantial debate has occurred among scholars, historians, and the general public surrounding his legacy. Supporters have pointed to a more efficient and prosperous economy as a result of Reagan's economic policies, foreign policy triumphs including a peaceful end to the Cold War, and a restoration of American pride and morale. Proponents also argue Reagan restored faith in the American Dream after a decline in American confidence and self-respect under Jimmy Carter's perceived weak leadership, particularly during the Iran hostage crisis. Reagan remains an important symbol of American conservatism, much in the same way that Franklin Roosevelt continued to serve as a symbol of liberalism long after his own death. Despite the continuing debate surrounding his legacy, many conservative and liberal scholars agree that Reagan has been one of the most influential presidents since Franklin Roosevelt, leaving his imprint on American politics, diplomacy, culture, and economics through his effective communication, dedicated patriotism and pragmatic compromising. Since he left office, historians have reached a consensus, as summarized by British historian M. J. Heale, who finds that scholars now concur that Reagan rehabilitated conservatism, turned the nation to the right, practiced a considerably pragmatic conservatism that balanced ideology and the constraints of politics, revived faith in the presidency and in American exceptionalism, and contributed to victory in the Cold War. Hugh Heclo argues that Reagan himself failed to roll back the welfare state, but that he contributed to a shift in attitudes that led to the defeat of efforts to further expand the welfare state. Heclo further argues that Reagan's presidency made American voters and political leaders more tolerant of deficits and more opposed to taxation. In 2017, a C-SPAN survey of scholars ranked Reagan as the ninth greatest president. A 2018 poll of the American Political Science Association’s Presidents and Executive Politics section also ranked Reagan as the ninth greatest president. A 2006 poll of historians ranked the Iran-Contra affair as the ninth-worst mistake made by a sitting American president. ^ Bruce J. Schulman and Julian E. Zelizer, eds. Rightward Bound: Making America Conservative in the 1970s (Harvard UP, 2008) pp 1-10. ^ Andrew Busch, Regan's victory: the presidential election of 1980 and the rise of the right (UP of Kansas, 2005). ^ J. Lull, and S. Hinerman, "The search for scandal' in J. Lull & S. Hinerman, eds. Media scandals: Morality and desire in the popular culture marketplace (1997) pp. 1-33. ^ Timothy E. Cook and Paul Gronke. "The skeptical American: Revisiting the meanings of trust in government and confidence in institutions." Journal of Politics 67.3 (2005): 784-803. ^ James Davison Hunter, Culture wars: The struggle to control the family, art, education, law, and politics in America (1992). ^ Earl Black and Merle Black, Politics and Society in the South (1989) p 249. ^ a b c Biskupic, Joan (September 4, 2005). "Rehnquist left Supreme Court with conservative legacy". USA Today. Retrieved February 27, 2016. ^ a b c d "U.S. Senate: Supreme Court Nominations: 1789-Present". www.senate.gov. Retrieved June 15, 2017. ^ Parlapiano, Alicia; Patel, Jugal K. (June 27, 2018). "With Kennedy's Retirement, the Supreme Court Loses Its Center". New York Times. Retrieved July 20, 2018. ^ D'Souza, Dinesh (June 8, 2004). "Purpose". National Review. Retrieved February 16, 2009. ^ Karaagac, John (2000). Ronald Reagan and Conservative Reformism. Lexington Books. p. 113. ISBN 0-7391-0296-6. ^ Shapiro, Bernard M. (March 1, 1993). "Presidential Politics And Deficit Reduction: The Landscape Of Tax Policy In The 1980S And 1990S". Washington and Lee Law Revie. 50 (2). ^ Steuerle, C. Eugene (1992). The Tax Decade: How Taxes Came to Dominate the Public Agenda. Washington D.C.: The Urban Institute Press. p. 122. ISBN 0-87766-523-0. ^ Cline, Seth (March 1, 2013). "What Happened Last Time We Had a Budget Sequester?". US News and World Report. Retrieved May 18, 2017. ^ Donnelly, H. (1987). "Broadcasting Deregulation". CQ Press. Retrieved November 29, 2017. ^ a b Plumer, Brad (January 30, 2013). "Congress tried to fix immigration back in 1986. Why did it fail?". Washington Post. Retrieved November 27, 2017. ^ Reagan, Ronald. (November 6, 1986) Statement on Signing the Immigration Reform and Control Act of 1986. Collected Speeches, Ronald Reagan Presidential Library. Retrieved August 15, 2007. ^ "The War on Drugs". pbs. org. May 10, 2001. Retrieved April 4, 2007. ^ Randall, Vernellia R (April 18, 2006). "The Drug War as Race War". The University of Dayton School of Law. Retrieved April 11, 2007. ^ a b Bachman, Gerald G.; et al. "The Decline of Substance Use in Young Adulthood". The Regents of the University of Michigan. Retrieved April 4, 2007. ^ a b c "Thirty Years of America's Drug War". PBS. Retrieved April 4, 2007. ^ Johnson, Julie (November 19, 1988). "REAGAN SIGNS BILL TO CURB DRUG USE". New York Times. Retrieved December 7, 2017. ^ "The Reagan-Era Drug War Legacy". stopthedrugwar.org. June 11, 2004. Retrieved April 4, 2007. ^ a b Roberts, Steven V. (September 11, 1988). "THE NATION; Reagan's Social Issues: Gone but Not Forgotten". New York Times. Retrieved December 7, 2017. ^ Shull, Steven A. (1999). American Civil Rights Policy from Truman to Clinton: The Role of Presidential Leadership. M.E. Sharpe. p. 94. ^ Scheer, Robert (2006). Playing President: My Close Ecounters with Nixon, Carter, Bush I, Reagan, and Clinton--and How They Did Not Prepare Me for George W. Bush. Akashic Books. p. 154. ISBN 978-1-933354-01-9. ^ Farivar, Cyrus (August 27, 2014). "The executive order that led to mass spying, as told by NSA alumni: Feds call it "twelve triple three"; whistleblower says it's the heart of the problem". Ars Technica. Retrieved December 23, 2017. ^ Jaycox, Mark (June 2, 2014). "A Primer on Executive Order 12333: The Mass Surveillance Starlet". San Francisco, California: Electronic Frontier Foundation. Retrieved December 23, 2017. ^ Dionne, Jr., E.J. (1986). "ELECTIONS; DEMOCRATS GAIN CONTROL OF SENATE, DRAWING VOTES OF REAGAN'S BACKERS; CUOMO AND D'AMATO ARE EASY VICTORS; WHAT AWAITS CONGRESS; BROAD G.O.P. LOSSES". New York Times. Retrieved May 13, 2018. ^ Busch, Andrew (1999). Horses in Midstream. University of Pittsburgh Press. pp. 126–135. ^ G. Thomas Goodnight, "Ronald Reagan's re‐formulation of the rhetoric of war: Analysis of the 'zero option,' 'evil empire,' and 'star wars' addresses." Quarterly Journal of Speech 72.4 (1986): 390-414. ^ Magnuson, Ed (November 21, 1983). "Getting Back to Normal". Time. ^ "United Nations General Assembly resolution 38/7, page 19". United Nations. November 2, 1983. ^ Gaidar, Yegor (2007). Collapse of an Empire: Lessons for Modern Russia (in Russian). Brookings Institution Press. pp. 190–205. ISBN 5-8243-0759-8. ^ Paul Vorbeck Lettow (2006). Ronald Reagan And His Quest to Abolish Nuclear Weapons. p. 133. ^ "1989: Malta summit ends Cold War". BBC News. December 3, 1984. Retrieved August 12, 2011. ^ Smith, William E. (September 16, 1985). "South Africa Reagan's Abrupt Reversal". TIME. Retrieved April 14, 2014. ^ a b Amadeo, Kimberly. "History of NAFTA and Its Purpose". The Balance. Retrieved November 28, 2017. ^ Tolchin, Martin (April 23, 1985). "U.S. Signs Trade Pact With Israel". New York Times. Retrieved November 28, 2017. ^ "Travels of President Ronald Reagan". U.S. Department of State Office of the Historian. ^ Altman, Lawrence K (October 5, 1997). "Reagan's Twilight – A special report; A President Fades into a World Apart". The New York Times. Retrieved June 18, 2008. ^ "Reaction to first Mondale/Reagan debate". PBS. October 8, 1984. Archived from the original on February 18, 2001. Retrieved December 31, 2007. ^ a b "1984 Presidential Election Results". David Leip. Retrieved May 25, 2007. ^ Dreier, Peter (February 4, 2011). "Reagan's Real Legacy". The Nation. Retrieved April 7, 2018. ^ "Scholars rate worst presidential errors". USA Today. AP. February 18, 2006. Retrieved August 31, 2018. Brands, H.W. (2015). Reagan: The Life. New York: Doubleday. Beschloss, Michael (2007). Presidential Courage: Brave Leaders and How They Changed America 1789–1989. Simon & Schuster. Cannon, Lou (2000). President Reagan: The Role of a Lifetime. New York: Public Affairs. ISBN 1-891620-91-6. Cannon, Lou; Michael Beschloss (2001). Ronald Reagan: The Presidential Portfolio: A History Illustrated from the Collection of the Ronald Reagan Library and Museum. PublicAffairs. ISBN 1-891620-84-3. Heclo, Hugh (2008). "The Mixed Legacies of Ronald Reagan". Presidential Studies Quarterly. 38 (4): 555–574. JSTOR 41219701. Leffler, Melvyn P. (2007). For the Soul of Mankind: the United States, the Soviet Union, and the Cold War. Hill and Wang. Leuchtenberg, William E. (2015). The American President: From Teddy Roosevelt to Bill Clinton. Oxford University Press. ISBN 9780195176162. Pemberton, William E. (1997). Exit with Honor: The Life and Presidency of Ronald Reagan. Routledge. Reagan, Ronald (1990). An American Life. New York: Simon and Schuster. ISBN 0-7434-0025-9. Weisberg, Jacob (2016). Ronald Reagan. Times Books. ISBN 978-0-8050-9728-3. Wilentz, Sean (2008). The Age of Reagan: A History, 1974-2008. HarperCollins. ISBN 978-0-06-074480-9. Diggins, John Patrick (2007). Ronald Reagan: Fate, Freedom, and the Making of History. New York: W. W. Norton. Hertsgaard, Mark. (1988) On Bended Knee: The Press and the Reagan Presidency. New York, New York: Farrar Straus and Giroux. Matlock, Jack (2004). Reagan and Gorbachev: How the Cold War Ended. New York: Random House. ISBN 0-679-46323-2. Walsh, Kenneth (1997). Ronald Reagan. New York: Random House Value Publishing, Inc. ISBN 0-517-20078-3.